The diameter of the discharge port. For high speed applications, our recommended discharge dimensions have been incorporated in a separate bearing accessory called an oil control ring. The oil control ring fits into the housing as a stationary shroud that provides proper clearance around the rotating thrust collar, and includes a properly sized tangential discharge opening. 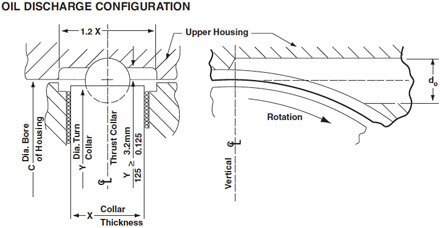 You can find bearing housing dimensions for oil control ring installation below. In the event that an oil control ring cannot be used, you may wish to machine your housing for an optimized discharge configuration. You will find our recommended values for these critical discharge dimensions below. We recommend a tangential discharge opening for all applications, especially those with a surface speed above 4,500 feet per minute (22.86 m/s) at mean diameter. This discharge configuration reduces power loss by minimizing oil churning and excessive back pressure. Radial discharge openings can be used where speeds are lower and ample passages follow the discharge opening. In some cases, radial-opening performance can be improved by placing a recess around the opening to decelerate the discharge oil. Such a recess allows the oil to change direction with minimal disturbance. 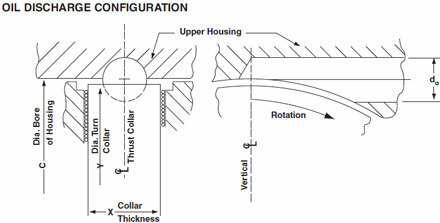 The discharge opening should be located in the top half of the bearing housing. Oil flow should be started prior to shaft rotation wherever practical. If this isn't possible, retain some oil for initial lubrication in the bearing cavity. Oil flow volume is best controlled at the inlet to the bearing, not at the discharge outlet. Oil passages in the thrust bearing base ring are designed for flow velocities of six to eight feet per second (1.8 - 2.4 m/s).